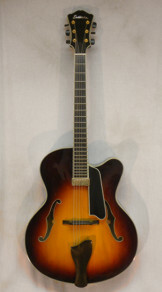 This is one incredible archtop guitar! It features a large 17" lower bout, a floating Kent Armstrong pickup, and a nitrocellulose lacquer finish. The AR810ce is all solid wood and hand carved with a Sitka Spruce top and flame Maple back and sides for the ultimate in archtop tone! Includes a nice hard shell case and a custom setup by your friends at Steilberg String Instruments.